We love this one-pot vegetarian penne pasta on weeknights. Veggies, herbs, and lemon make the pasta burst with flavor. Ready in 20 minutes! Our dishwasher recently broke, which has made me realize just how many dishes we (mostly I) use in a day. For example, I start with a big glass of water first thing in the morning before I make a smoothie. Next comes iced cold brew coffee. When it’s time to make lunch, I’m usually too lazy to go upstairs to get my previously used water glass, so I’ll grab another. In case you aren’t keeping track, I’m up to 4 glasses by about noon. There’s also one by my bed, two in the bathroom, and by the end of the day there will be a larger collection at my desk. I know – first world problems. But now that I’m washing dishes by hand, I’m trying to change my ways. I’ve learned that it’s far easier to rinse and reuse the same glass than it is to have a sink full of glassware (and of course other dishes) at the end of the day when I’m trying to start dinner. All of this extra dishwashing led me to try the infamous one-pot pasta. It was apparently invented by a French chef and later made internet-famous by Martha. I never considered trying it before because it’s a little too trendy and I’ve never found it to be a big deal to wash the pasta pot. But by now I was tired of washing dishes, and this recipe seemed incredibly easy. And it was (is). It’s delicious too. Because the starches from the pasta stay with your pasta, this method creates a creamy sort of sauce that wouldn’t be there if you cooked and drained your pasta. I felt like Martha’s recipe lacked a bit of flavor so for my version I’ve amped up the herbs & seasonings. I also added lemon juice, lemon zest and my market-haul of summer veggies. In lieu of freshly grated Parmesan cheese, I made a “cheese-like” hempseed topping. This penne pasta is nicely flavorful on its own, so feel free to use cheese or “cheese”, or skip both. 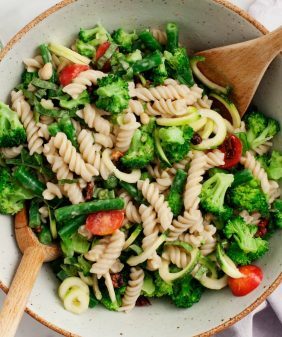 I do recommend adding toasted pine nuts (I forgot to add them before we took the photo) because they add a necessary bit of texture to this otherwise soft pasta. I had a little trouble deciding on the serving size for this recipe. The final pot looked “family size,” but then we ate the whole thing, with Jack going back for multiple helpings. So I’m going to say this serves 2 hungry people, and maybe a few more if you have smaller eaters or if you serve this with a protein on the side. 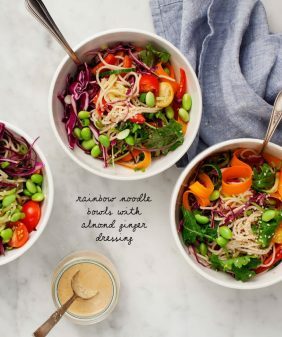 Love making easy vegetarian pasta dishes? This Many-Veggie Roasted Vegetable Pasta is another of my favorite recipes. 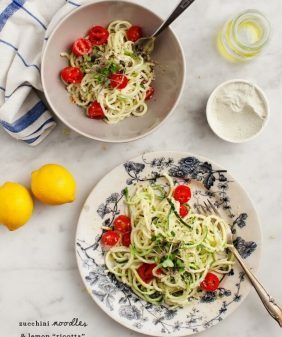 In a large pot, combine the pasta, tomatoes, leeks, zucchini, bell pepper, garlic, olive oil, lemon juice and zest, oregano, salt, red pepper flakes and basil. Add the water and stir. Bring to a boil, cover, and boil for 8 minutes. Give it a stir around the 5 minute mark to make sure nothing is sticking to the bottom of the pan and put the the cover back on. At 8 minutes, test the pasta for doneness. Remove the pot from the heat, stir, and let it sit for about 2 minutes to allow the sauce to thicken. Make the Vegan Hemp Seed Topping: In a food processor, combine the hemp seeds, nutritional yeast, sunflower seeds and salt and pulse to combine. Serve with the chopped parsley, toasted pine nuts and parmesan cheese or Vegan Hemp Seed Topping, if using. Is the olive oil essential? Amazing recipe!! I wash my dishes and nowadays our sink is broken so…this made my day! Thank you! I feel your pain. We just replaced our dishwasher after two months without and a couple of months before that of the old one being unreliable. It’s hot and dry here, with watering restrictions, so I would catch the water in a watering can while waiting for it to get hot. (Just one more hassle, but I had too much guilt about cold water running down the drain.) I was in Peace Corps in Africa long ago and had no running water. Let me tell you, one-pot meals are really big then. The starch of the pasta making it creamy is the same technique that makes spaghetti/fettuccini carbonara so amazing–there’s no cream, just the cooking water and eggs. Ha, well I did live without one for years – but it sure is easy to get used to having one! My dishwasher broke a while back and it was just the worst! It’s crazy how quickly you get used to having one, they’re a godsend! Gotta love a one pot meal though!! 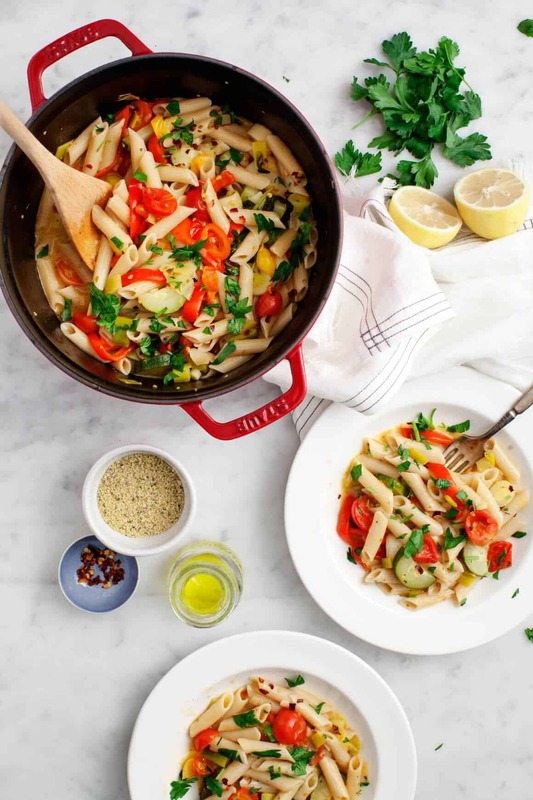 Omg, I mean you seriously had me at one-pot but this pasta looks incred! I seriously have got to make it! This looks superb! I’m sorry your dishwasher is broken, but I’m glad it lead to this amazing recipe. Hope it gets fixed soon. 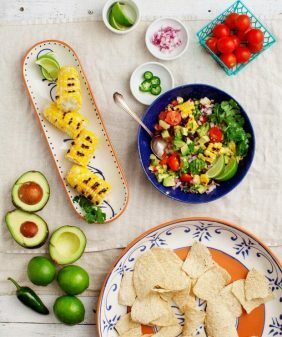 It looks simple and delicious ! Perfect match for a cool evening. You had me at ‘one-pot’. Reading this made me very happy! I love the creativity of pasta dishes, and this is one of the best that I have seen. We made it as is, and was wonderful! We had this tonight, delish! The veggies came from our garden, thanks for your seasonal and excellent recipes! Much enjoyed! Paired with Four Hands Pinot Grigio. Much like others who have responded you had me at 1 pot. 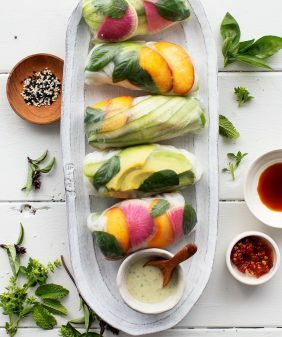 I’m making this tomorrow; will be perfect for a 100 degree day! Hi, did you use shelled hempseeds? One Pot Meals are awesome and like this dish. Will be making this tomorrow. Sorry to hear about your dishwasher. I live in an apartment, I cook allot and don’t have a dishwasher and it wouldn’t fit if they wanted to fit one in my small kitchen. So I wash everything by hand, many multiple times a day. Hi, I also wanted to know if you used shelled or unshelled hempseeds. Thanks lots! Great recipe! My suggestion would be to add the lemon juice 5 min. before serving …the flavours will be brighter. We don’t have nutritional yeast here. What can I substitute it with? You can skip it – this pasta is great on it’s own without the topping. This was great. Even my kids who normally eat regular pasta enjoyed it. Thanks and hope you get your dishwasher sorted soon! I opted to sautee all of the veggies beforehand. I didn’t want to risk them getting too soggy while the pasta cooked and having them lose all of their nutrients in the water. I love the one-pot concept so I just set the veggies aside and then boiled water in the same pot with all of the sautee flavorings + extra salt. It came out pretty tasty! I love garden veggie filled pasta dishes ♥ Sunflower seeds, hemp, and nutritional yeast were lovely additions but, the flavors of the pasta are also good on their own. I’d make it again! Great pasta dish. It was pretty good and has a very nice blend of flavors. Thanks for posting, I will be making this again for sure. Hi Daniella, I’m so happy to hear! Going to try this recipe but have to “convert it” to “Non-Gluten” since my type 2 diabetes says NO gluten free recipes. 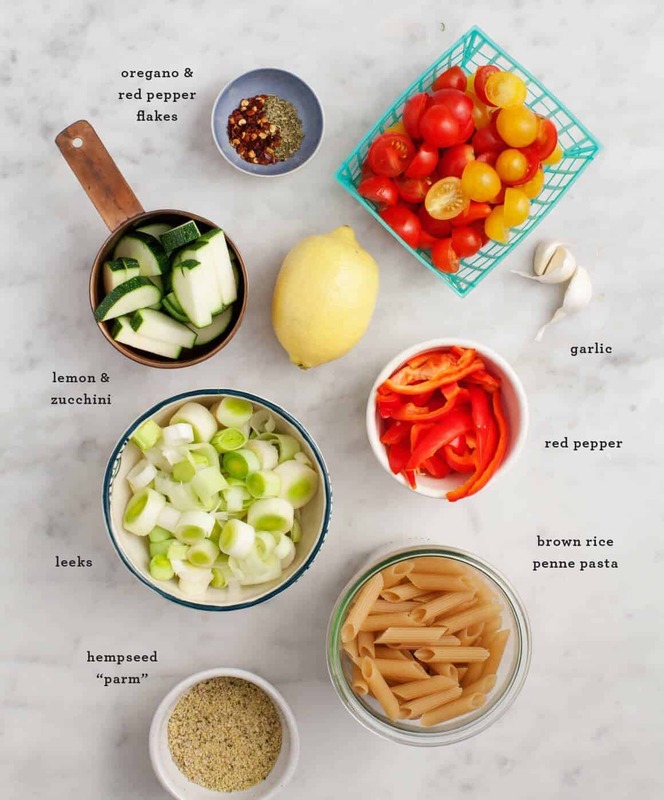 Will use wheat pasta..the pics and ingredients really caught my attention… plus.. “one pot” convenience. Tried the recipe last Thursday night. Overdid the crushed red pepper flakes but that was “my bad”…gives me a reason to have again with right amount of red pepper. Had plenty of left over. My wife had some next day for lunch. Made a great “cold pasta slad” ! Penne Pasta looks delicious like ones at http://www.sipofwellness.com You guys are doing wonders online! 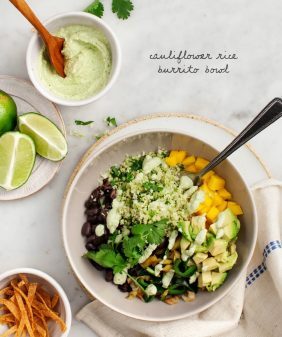 I can’t get over how delicious this recipe is! I have to admit that I was a bit suspicious at first as whenever I get that one vegetarian option at restaurants it’s usually penne with some vegetables and it’s a bland, boiled mess. But oh my goodness, the flavours in this are amazing! I did add parmesan the first time, but it’s really bursting with so much delicious flavor on its own that it’s not really necessary. I also love how easy the prep and cleanup is. I can’t wait to try more of the recipes on your site.